S: Bust: 84cm / 33.07", Waist: 68cm / 26.77", Length: 100cm / 39.37"
M: Bust: 90cm / 35.43", Waist: 74cm / 29.13", Length: 101cm / 39.76"
L: Bust: 96cm / 37.80", Waist: 80cm / 31.50", Length: 102cm / 40.16"
XL: Bust: 103cm / 40.55", Waist: 87cm / 34.25", Length: 103cm / 40.55"
2XL: Bust: 110cm / 43.31", Waist: 94cm / 37.01", Length: 104cm / 40.94"
[Material]: 97% polyester, 3% spandex. 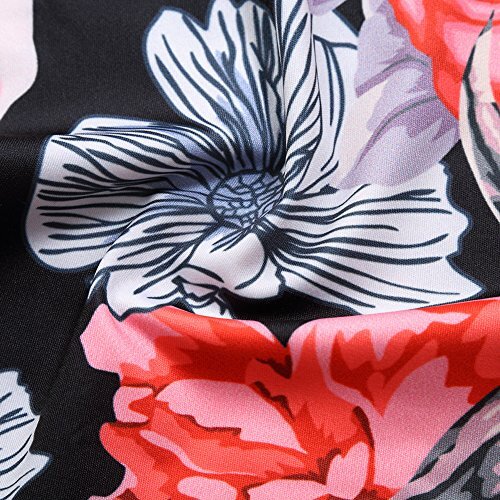 Soft comfy fabric ensure a comfortable flattering fit. 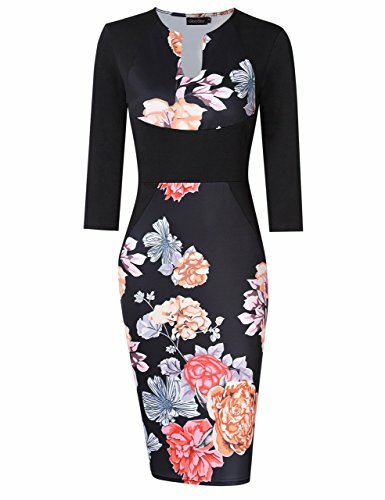 [Features]: 3 4 sleeves and cut out deep v-neck, elegant floral print knee length midi bodycon pencil dress. [Suitable Season]: Three quarter sleeve slim dress is a perfect closet staple for spring/fall seasons; Add jackets and heels for a chic elegant look! [Occasions]: Empire waist patchwork design elongates leg line, it will lend glamour when you wear in Cocktail Party, Business, Work, Evening, Formal, Casual, Wedding, Dinner, and Special Occasions. [Note]:Please kindly check the size picture before you make an order, thanks.This black dress will look great with killer heels, matching some jewellery.